With all the zesty bite of hot sauce and a smooth buttery edge, this buffalo wing sauce is easy to make and great to have on hand to make all of the endlessly tasty buffalo chicken dishes for weeknight dinners or weekend barbecues. Those that follow this little food blog may be surprised to see a recipe for buffalo wing sauce grace these pages, and trust me – I’m shocked, too. I’ve mentioned in the past that I tend to have trouble with spicy foods, and though I’m still firmly waving my “can’t handle the heat” flag, fans of wing sauce will be the first to tell you that wing sauce isn’t really hot. It’s got some bite to it, sure, but it’s not a sting. In fact, the mildness of this sauce is what makes it the perfect gateway food to more zesty dishes. And that, my friends, is why I’ve fallen in love with it. What’s the difference between hot sauce and wing sauce? For the longest time I didn’t think there was a big difference between hot sauce and wing sauce, but the truth is there is…. and there isn’t. Hot sauce (like Tobasco) is made with hot peppers, vinegar, and a few standard spices. The whole point is to get the heat of the peppers and amply them with the tartness of vinegar. Wing sauce is made by essentially cooking hot sauce (usually with a cayenne pepper base) with a healthy dose of butter and a few other spices. So wing sauce is made with hot sauce, but the butter makes it more mild and smooth. So while hot sauce and wing sauce are similar in nature, there’s also enough “other” ingredients in wing sauce to make it its own distinct flavor. How hot is buffalo wing sauce? It’s much milder than classic hot sauce but will definitely leave your taste buds tingling. Step 1 – In a saucepan over medium heat, add butter, cayenne pepper sauce, white wine vinegar, Worcestershire sauce, and garlic powder. 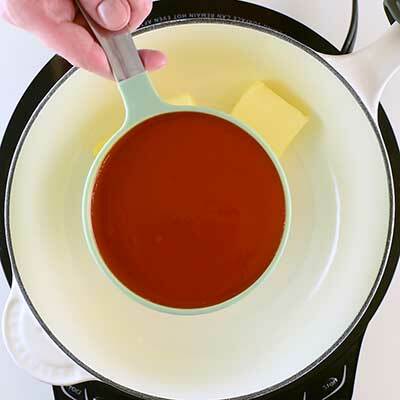 Step 2 – Let cook, stirring constantly, until butter has completely melted. Step 3 – Remove sauce from heat, let cool, then enjoy! What can you make with buffalo wing sauce? This recipe makes about 1 1/2 cups of wing sauce, but a little can go a long way. Check out some of these other great recipes you can make with it! There are plenty of options for buffalo chicken lovers, too. This recipe makes a “reasonable” amount of buffalo sauce, averaging out at about 1 1/2 cups. However, this is a recipe you can be doubled or tripled as much as you need, so keep that in mind when measuring your ingredients. If you can, it’s best to use this sauce as soon as it’s made. However, if making it in advance, be sure to store it in a microwave-safe container. The reason for this is that the butter in the sauce may separate and harden along the top of the sauce once chilled. If this happens, all you need to do is microwave the sauce for 20 seconds, stir, and then repeat as necessary. In a saucepan over medium heat, add cayenne pepper sauce, butter, white wine vinegar, Worcestershire sauce, and garlic powder. Bring mixture to a boil, stirring constantly. Continue cooking and stirring until butter has melted. 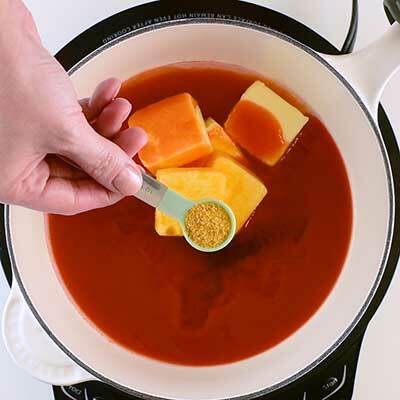 Once butter melts, cook for an additional 1-2 minutes or until butter appears absorbed in the sauce. Remove sauce from heat and let cool. For best results, use wing sauce immediately. 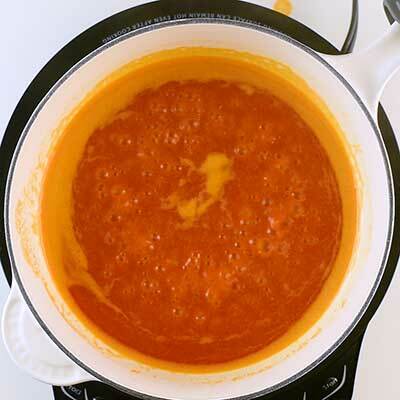 If making sauce in advance, place sauce in a microwave-safe container and store in the refrigerator for up to 5 days. When ready to use, check to see if butter in sauce has hardened; if it has, microwave the sauce for twenty seconds, then stir thoroughly. Continue to microwave and stir until butter has melted and is fully incorporated into the sauce again. Recipe from Better Homes & Gardens. You know, it never ever even occurred to me that you could make buffalo sauce at home, lol. But it looks so easy! I can’t wait to give it a try! I pretty much want to put this zesty sauce on everything! Could I can this sauce? If so, how long should I water bath it? Or does it need to be stored in the Fridge?